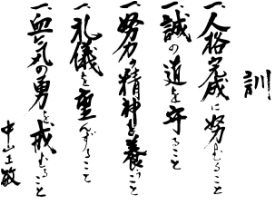 Dojo Kun - the fundamental tenets of Shotokan. Calligraphy by Master Masatoshi Nakayama. Katayanagi Shotokan Karate, located in Port Washington, Long Island, New York is a traditional martial arts school. We are members of the International Shotokan Karate Federation, one of the largest karate organizations in the world, led by Chairman Hiroyoshi Okazaki, 9th Dan. Shotokan, in addition to being an excellent form of self defense, is an art in which the student develops the discipline and peace of mind to handle life's many challenges. It's also a terrific workout. ​Please contact us and learn Shotokan Karate from a Certified Senior Instructor of the ISKF.